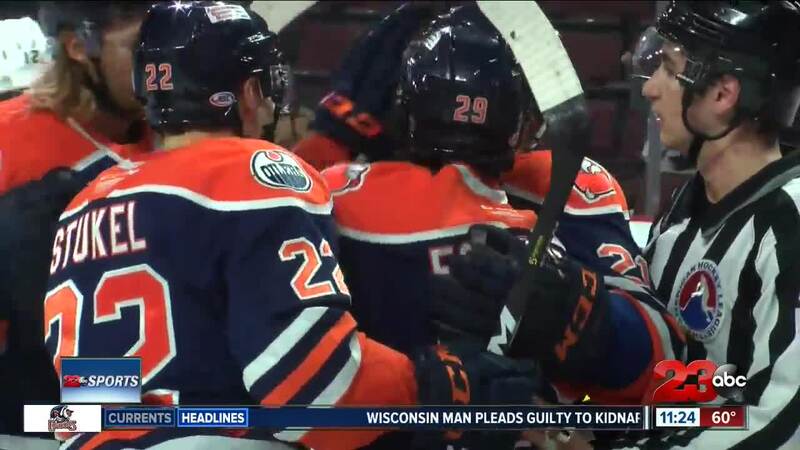 BAKERSFIELD, Calif. — The Bakersfield Condors (38-17-3-1; 81pts) sit just a point shy of the team's first-ever American Hockey League playoff spot after a 5-2 win over the Ontario Reign (22-29-6-2; 53pts) on Wednesday night. A hot start in the first period with three Condors scoring as C Luke Esposito scored twice and three other Condors recorded multi-point nights.The Condors can clinch a playoff berth on Friday with either a point against San Diego OR if the Tucson / Colorado game ends in regulation, regardless of winner. Bakersfield now holds an eight point lead on the division with eight games remaining in the regular season. The Condors will face San Diego on the road on Friday and then turnaround to host San Jose on Saturday at Rabobank Arena.